Dragon Fruit or ‘Pitaya’ are a tropical fruit tree ( actually a vine) readily available for sale in Queensland and used both as a fruit producing plant and a flowering ornamental with fragrant flowers that fill the night air as they open with a lovely scent. Originally from South America, Dragon Fruit trees were introduced by the French into Vietnam where it is known as “thang loy”. It is the scaley skin that gives the fruit its name. Dragon Fruit are actually a ‘tropical’ cactus and grow well in the Northern Territory and parts of Queensland. Varieties include the red pitaya / red dragon fruit (picture right) or species Hylocereus polyrhizus is probably the most common however, yellow pitaya (Selenicereus megalanthus) and white pitaya (Hylocereus undatus) are also available. 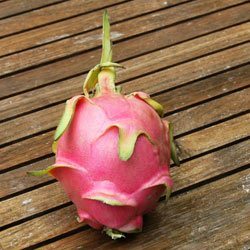 Dragon Fruit are a reasonably fast growing they are best planted in a well drained sunny position near a post for support. Dragon fruit can be grown from seed or from cuttings if required. Pollination of dragon fruit trees is by bats and moths and it may be necessary to hand pollinate to achieve fruit set. Dragon Fruit or ‘Pitaya’ have a sweet taste and can be eaten fresh with ice cream or other fruit. Fruit salads, blended into juice or as a smoothie are other uses. Propagation is easy from cuttings, similar to many other plants, let the cuttings dry or ‘heal’ for 1 – 2 days before planting in a free draining potting mix. In cooler climates try growing dragon fruit in a warm sunnt position protected from wind and frosts, a position againast a fence or wall with lots of sun works well. Easy to grow the fruit is said to be high in antioxidants, fibre and vitamin C.
Fruits throughout the year with the main crop in summer.